The New York City mayoral election of 2001 was held on November 6, 2001. Incumbent Republican mayor Rudy Giuliani could not run again due to term limits. As Democrats outnumber Republicans by 5 to 1 in the city, it was widely believed that a Democrat would succeed him in City Hall. However, businessman Michael Bloomberg, a lifelong Democrat, changed his party affiliation and ran as a Republican. Mark J. Green narrowly defeated Fernando Ferrer in the Democratic primary, surviving a negative contest that divided the party and consumed the vast majority of the Green campaign's financial resources. A number of factors led to Bloomberg's ultimate victory in the general election, after a campaign that was largely overshadowed by the 9/11 terrorist attacks, with 50.3% of the vote (to Green's 47.9%). The primaries were originally scheduled for September 11. However, the September 11 attacks caused the primary to be postponed until September 25, and the run-off occurred on October 11. The September 11 terrorist attacks occurred on the morning that the primaries had been scheduled and also may have contributed to Green's loss, since the media barely covered the subsequent general election. Walter Iwachiw was a write-in candidate against Julia Willebrand, the Green Party candidate approved by the New York City Board of Elections. The Board of Elections dismissed the petitions of Walter Iwachiw and several other Green Party candidates. Green clearly led among Manhattan's Democrats, Ferrer among The Bronx's and Vallone among Staten Island's. Ferrer and Green were evenly matched in Brooklyn, while all three candidates were essentially tied in Queens. Rudy Giuliani, who was riding high approval ratings following the 9/11 attacks, publicly endorsed Bloomberg. Green made a controversial decision during the primary run-off to support Giuliani's unprecedented attempt to extend his own mayoral term, in the name of the emergency of 9/11. Ferrer opposed Giuliani's ultimately unsuccessful attempt at term self-extension, and was able to accuse Green of being rolled over by Giuliani. Unlike his cash-poor Democratic rival, who had just emerged from an expensive primary and expected to rely on traditionally reliable free media coverage that never materialized, Bloomberg continued to spend $74 million on TV ads and direct mail in the weeks after the attacks, which was a record amount at the time for a non-presidential election (Bloomberg would break his own record in 2005). The Economist wrote, "The billionaire businessman [Bloomberg] is usually seen as one of the post-September 11th winners (if such a word can be so used): he would probably have lost the mayoralty to Mark Green, a leftish Democrat, had the terrorist strike not happened. Yet it is also worth noting that his election probably spared New York city a turbulent period of score-settling over Rudy Giuliani's legacy." The election was also notable for two non-politician semi-celebrities running on third-party tickets: Bernhard Goetz, who had achieved fame in 1984 as the "subway vigilante" for shooting four young men who tried to rob him, on the Fusion Party ticket, and Kenny Kramer, who was the inspiration for the character Cosmo Kramer on the TV show Seinfeld, on the Libertarian Party ticket. Michael Bloomberg secured victory in a close election, with 744,757 votes. Although he lost in three of the five boroughs, he was able to collect enough votes in Staten Island and Queens to come in a tight first. 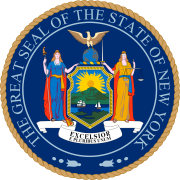 Under New York's electoral fusion rules, candidates were allowed to run representing multiple parties. ^ Nagourney, Adam. "Bloomberg Puts Eggs In a Basket: Giuliani's", The New York Times, October 28, 2001. Accessed December 31, 2007. "Mayor Rudolph W. Giuliani's decision to endorse Michael R. Bloomberg at City Hall yesterday provides Mr. Bloomberg with perhaps his greatest hope for victory as he moves into the final days of what his supporters describe as a troubled campaign." ^ " New York's difficult year", The Economist, September 12, 2002. Accessed December 31, 2007.